Activists furious at police attempts to delay traditional Jewish march in deference to Muslim worshippers. "Why can't they pray later?" The traditional Tisha B'Av Walk around the Temple Mount will be held next week on the 9th of the Hebrew month of Av, as it has every year for the past 19 years. The walk takes place on the night of the Fast of the 9th of Av (or Tisha B'Av in Hebrew), which commemorates the destruction of the two Jewish Holy Temples in Jerusalem, and is a revived medieval tradition which expresses the Jewish yearning for the restoration of the Temple in Jerusalem. The practice is based on a verse in Tehillim (Psalms) 48:13: "Walk about Zion, and go round about her; count the towers thereof." The First Temple (Beit Hamikdash in Hebrew), famously known as "Solomon's Temple" after its builder, the Biblical King Solomon, was destroyed by the Babylonian empire some two and a half thousand years ago. The Second Temple, also known as "Herod's Temple," after the Judean King Herod, was destroyed in 70 CE by Imperial Rome on the same day in the Hebrew calendar. This year, however, the Walk - scheduled for Monday evening (Jewish calendar days begin the previous evening) will depart considerably later than usual - at the unearthly hour of 11:30pm - following instructions issued by the police, who wish to coordinate events so that Muslims worshippers can complete their Ramadan celebrations on the Temple Mount before the Jewish walkers even set off. That decision has drawn ire from the Walk's organisers, Yehudit Katsover and Nadia Matar, co-directors of the "Women in Green", a grassroots Zionist organisation which campaigns to uphold Jewish rights in the land of Israel. Katsover and Matar point out that last year Tisha B'Av night also fell during the Muslim holy month of Ramadan, and that the police had attempted then to change the route of the Walk completely, citing unspecified "concerns for public safety." In response, Jewish worshippers appealed to the Supreme and, sure enough, the police withdrew their objection - but not before instructing that the event be postponed to 11:00pm. Nadia Matar explained to Arutz Sheva that she and fellow activists decided not to fight last year's postponement, as Tish'a B'Av evening fell on a Saturday evening, immediately after the Jewish Sabbath, during which religious Jews are prohibited from travelling anyway. 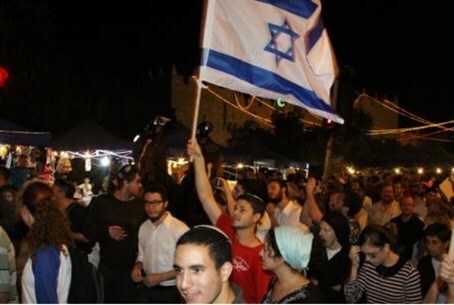 This year, however, Tisha B'Av falls on a Monday night, and the late timing on a weekday evening that the police are insisting upon will be prohibitive for many participants. At the beginning of the restoration of the traditional Tisha B'Av walk 19 years ago, the initiative was also met with resistance by the police, who refused point blank to approve the walk at all. "They never imagined that Jews would march there, in what they called "East Jerusalem", in the place where only Arabs roam," Matar remenisces. "We turned to the Supreme Court and said that if this is the sovereign, unified, undivided capital of Israel, there is no way we can not march there, and sure enough, we won, and the tradition of the Walk set out - literally and figuratively." Katsover and Matar raise the concern that amidst all the rhetoric about "public safety" - a catch-all phrase that has also been used to prohibit Jewish worshippers from praying on the Temple Mount itself - lies a cynical hope that a more limited number of marchers will show up due to the late hour. "It should be pointed out that in the 18 years that the Walk has been held, there has not been a single case of friction or confrontation between the marchers and local Muslims - a fact that reinforces the sense of frustration and anger following this decision by the police. "It is a disgrace. In the independent State of Israel, in sovereign Jerusalem, logic is working backwards. The Arabs ascend the Temple Mount but the Jews can only pray at the Western Wall. In a sovereign state, the Jews' events will only be held after the Arabs' events are finished. Why? Why can't they start their events later, so that we can march earlier?" Despite the ruling, however, organisers remain defiant, insisting that the late hour will not deter the masses from coming. "On the contrary," Matar insists, "it will bring even more people." The event, which will be held on the night of Monday 15th July, is expected to be attended by the Deputy Minister of Religious Affairs MK Rabbi Eli Ben Dahan; Deputy Defence Minister MK Danny Danon; Chairman of Professors for a Strong Israel, Prof. Aryeh Eldad; and Chairman of the Israel Land Fund, Aryeh King. The evening's events will begin with a public reading ceremony of the Book of Lamentations (also known as the Scroll of Eicha) at 10:30pm in Independence Park, located in downtown Jerusalem. At 11:30pm the Walk itself will set off from the park to the New Gate (Sha'ar HaKha'dash), Damascus Gate (Sha'ar Shekhem), Herod's Gate (Sha'ar Haprakhim), Lions' Gate (Sha'ar Ha'A'rayot) - where speeches will be made - and from there will move on to its conclusion at the Dung Gate (Sha'ar Ha'Ashpot), near the Western Wall.